The Dodge Challenger has been described as Dodge's answer to the Mustang and Camaro, and the 4th generation Challenger quickly became a favorite of many Mopar fans. 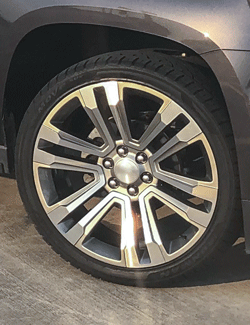 This version of our DG05 is a 20x9 inch chrome replica wheel designed to fit most versions of the Chrysler 300, as well as many Charger, Challenger, Daytona and Magnum models. Please check our fitment tab for specific year, make and model applications before ordering. This special wheel, tire and sensor package for the Chrysler 300 and compatible vehicles pairs a set of 4 DG05 chrome rims with Ironman GEN2 tires. Built using a next generation wear-resistant compound and featuring an advanced pressure distribution concept, the M+S rated iMove Gen2 AS provides even wear, longer tread life and all-season reliability. 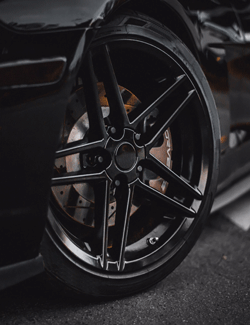 Of course, all OE Wheels rims are TUV, JWL, VIA, SAE or DOT approved, and are guaranteed to be straight and true (refer to our warranty tab for more information). Like all fine wheels, the DG05 should be washed with soap and water only, and dried with a clean microfiber cloth. Great looking wheels, better service. Ordered my wheel and tire package on a Monday, delivered by Friday. Tires were mounted and balanced with new TPS already installed. 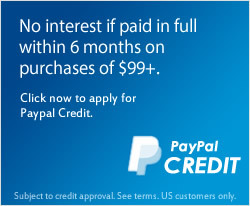 All this with free shipping. Unbelievable value, could not be any happier. Great company, would recommend this company to anyone.